Should Humanity Take Religion on Interstellar Space Voyage? Sending people to another star will be a monumental undertaking, and the challenges will be not just technological, but human. One thorny question, experts say, is whether to involve organized religions in the effort to mount an interstellar journey. 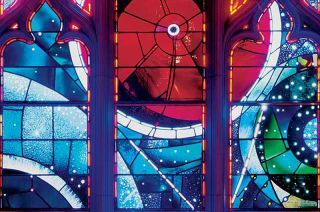 Religious leaders argued the issue Sept. 14 in Houston at the 100 Year Starship Symposium, a meeting to discuss the prospect of sending a space mission to another star within 100 years. The church has the resources, funding and reach to garner support for an interstellar mission, said Jason Batt, group life director at Capital Christian Center in Sacramento, Calif. Batt said there is "spiritual potential" in space travel and that the church should begin preparing an organization for an off-planet ministry. "The only way humanity can survive is if they leave behind the Earth-based religions," charged Rev. Alvin Carpenter, pastor at First Southern Baptist Church West Sacramento. "If there's any way to make this fail, bring Earth-bound religions." Religions, he argued, breed aggression and conflict, citing the violent history of his own faith, Christianity, in episodes such as the Inquisition and the Crusades. Many religions' negative stance on homosexuality has driven young gay people to commit suicide, he said. "When you bring a religion on a starship, you bring the toxicity that we have seen on Earth," Carpenter argued. "This is something that we do not wish to export to the stars." "All it takes is one charismatic fundamentalist, with a Bible or a Koran in his or her hand," to spark conflict aboard a starship, he added. But Batt said religion wouldn't necessarily be a disruptive force on such a mission. "I'm not going to lie, we've got a horrible history, but we've made major grounds," he said. "There is a nastiness around religion. But I would argue that might be part of humanity in general." Carpenter, however, advocated leaving religions behind on Earth, to allow room for new ways of thinking. "I think space-born religion is going to be based on science," he said. But the question of whether or not to invite religions to participate on an interstellar mission may be a moot point, because they will likely be part of such a voyage no matter what, Batt said. "Where humans go, they take religion with them," he said. "Even if we screen people and we say no religious principles, 100 years from now people are still going to return back to those things."